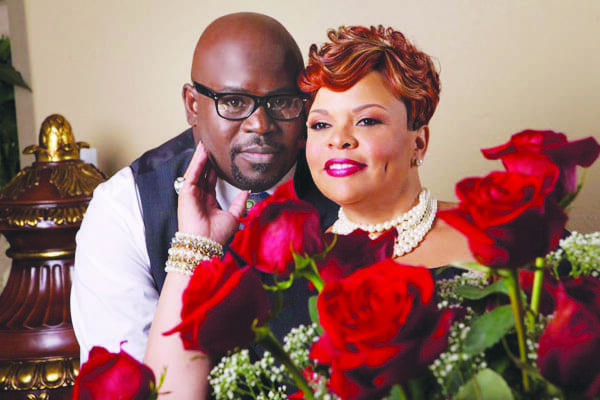 NASHVILLE, TN -— David and Tamela Mann are one of entertainment’s most beloved married power couples. The multi-talented, award-winning husband and wife dynamic duo has proven to their millions of fans that they can handle it all, having found success in film, television, and music. They recently wrapped up their national ‘Mann’s World Family Tour’ along with starring in their own hit TV series. From starring in the No. 1 TV and film franchise, Tyler Perry’s Meet The Browns together, to their current television hits, ‘The Manns’ (TV One) and ‘Mann & Wife’ (Bounce TV). Tamela and David continue to make audiences laugh with their wholesome brand of comedy. David and Tamela have been married for 20-plus years and say their secret to such an enduring marriage is really quite simple. “We really like each other,” says David while looking at his wife very adoringly. “And we’re in love. We enjoy each other’s company,” adds Tamela. The Manns were in town for a performance recently, and they shared with the Tribune one of their many holiday gift-giving memories from the last two decades and then some of since they’ve been husband and wife. TRIBUNE: Was the perfume stinky or something?